* New Negora and Shibara pre-orders......new Migora Mameras in stock!! First up.....we're starting pre-orders for 2 new figures. Negora ( Nishiki ) : Beautiful new koi fish colorway. Expected arrival is sometime in August!! 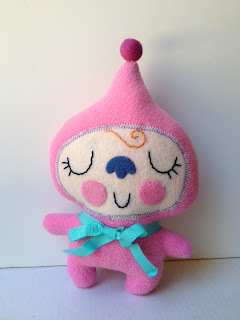 FUWA FUWA : Soft Creations Show !! 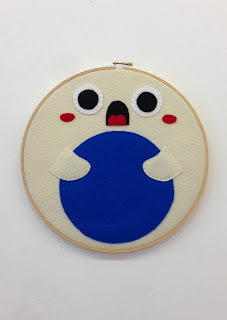 A very warm thanks to all that made it out to our Fuwa Fuwa : Soft Creations show. We had some amazing pieces...some of which are still available in our online shop. It's sometimes a difficult thing to sell felted or plush artwork to the mainstream public. Many people do not understand the time and labor involved or the design process. For most, they don't see the difference between these handmade items and something they might see at K Mart. Which is a shame. Just understanding that all the seams in a particular piece are painstakingly hand stitched instead of by machine.....should be enough for most to want to expend an extra $20 on something. Let's put it in perspective......a plush for our show...may take around 16-20 hours of sewing. Even if the design is relatively simple. The more complex the longer it would take, of course. At MINIMUM wage of $8 an hour, that would be $128 - $160. Just for labor. Add in cost of materials...and the artists must make a little to survive. That would make the item over $200 at a fair price. Knowing this and looking at some of the pieces in the show..I think one can now see that most of the artwork is extremely affordable, even underpriced. Here are a few samples and info about the artists..
Yoko is a japanese artist based in Wisconsin, US. 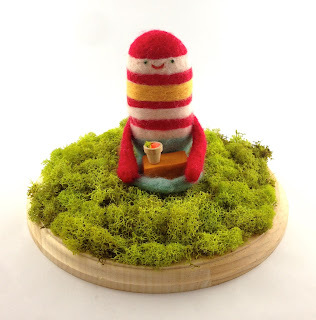 She works in both wet and needle felted methods and uses vibrant pop colors to create her super charming companions! Keiko is based in Tokyo, Japan. She emerged in the nineties and is one of the first "plush" artists ever and her creations range from small hand held size to extremely huge room size works. She's exhibited in galleries across the globe. 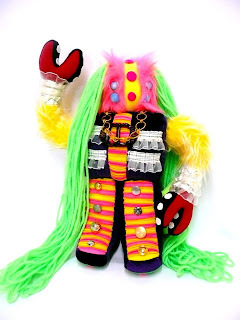 Recently, she has been in the spotlight for creating some amazing costumes for Japanese pop idol Kyary Pamyu Pamyu. Elizabeth is a Japanese American artist based in Los Angeles, USA. She has worked in animation at studios like Dreamworks and Sony Pictures Animation. She is currently directing on Adventuretime for Cartoon Network and she painted our mural here at Q Pop! Elizabeth's work conjures up whimsical imaginary worlds filled with loveable monsters and animals . Nicole is a story artist for Walt Disney Feature Animation. She has worked on Winnie the Pooh, and Prep and Landing. She's based in Los Angeles. Nicole creates intriguing pieces that convey her gift for story telling. Each piece is infused with minute details and acting hinting at subtle story development. Hiné Mizushima, who was born and raised in Japan, majored in Japanese traditional painting before working as a designer and Illustrator in Tokyo. She later moved to Rome, then Paris, and then NYC. Seven years ago she left New York for Vancouver, Canada where she lives with her family. 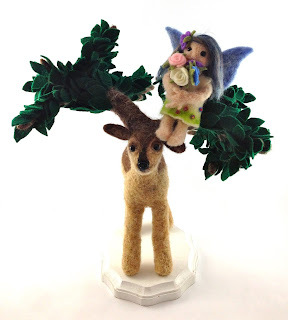 She is currently also a slow crafter, needlefelter, and stop-motion puppet animation video artist. She has recently been commissioned for a number of commercial music videos, including several for They Might Be Giants, were released on DVDs. Her Illustrations are mainly paper cutout and digital. 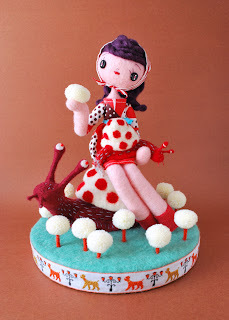 Her felt sculptures have been exhibited in galleries in NYC, LA, SF, Tokyo, Osaka and other cities, and are published as books and magazines as well. 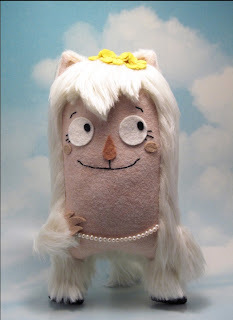 She sells her felt creations and prints on her Etsy handmade shop. Doug sews plush and draws comic strips, all the while wearing a beard. A real beard -- not a fake one. Every stitch is handsewn with man hands. OhFlo is a chinese artist based in the bay area. She's famous for making her often copied Mr. 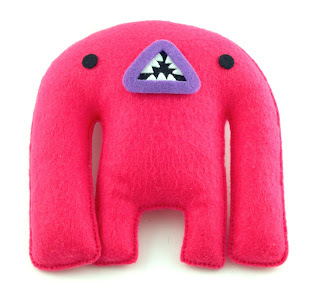 Fancy Whale plushes and creates adorable plush monsters and animals. Leana is an LA based artist that works with vintage textiles. 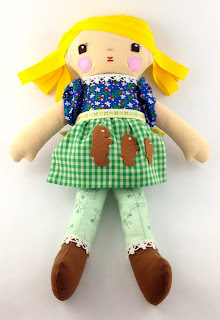 She creates wonderful soft figures as well as pillows, bags, postcards, and other useful household items. Aki Morishima is a Japanese artist based in Los Angeles. Her works include illustration, graphic design and felt works. Anna is an artist based in the bay area. She has worked in animation and in illustration creating characters and designs for cool stuff like Chowder on Cartoon Network and gift cards from Target. She's also teamed up with artists Amanda Visell and Michelle Valigura creating goods for the Switcheroo line. Tara is currently a character designer at Walt Disney TV animation working on the new Mickey Mouse shorts. She works in plush and markers and loves sloths!!! 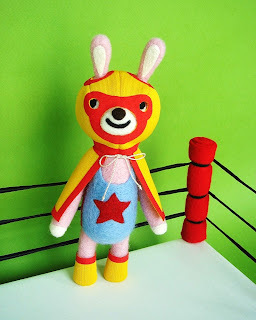 Michal has been making plush for a while. When she's not doing that she's working at Nickelodeon.